Whether you want a seat to watch the big game with friends or need to accommodate for guests over the holidays, this futon frame is the perfect pick for your home. 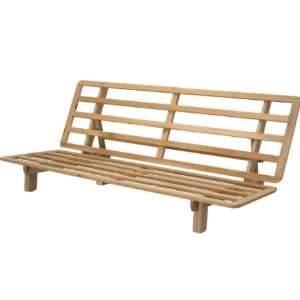 The classic design features a slatted design that can unfold into a lovely sleeping space. Made in the USA, this futon frame is crafted from tulip poplar. It has a weight capacity of 500 pounds. Overall Product Weight	47 lb. Overall Product Weight	52 lb. Seat Depth - Front to Back 24 In. Available in Full and Queen Sizes.